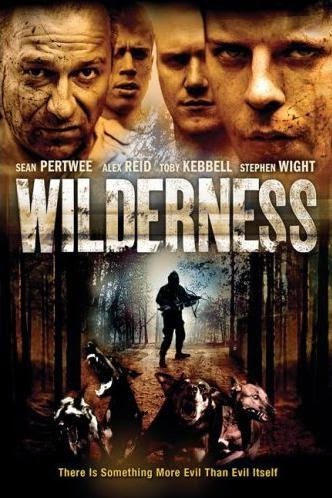 Tag line: "On this treacherous land, Justice and Power will battle for Supremacy"
A 2006 horror film produced in the UK, Wilderness tells the story of a group of delinquents who are being hunted by an unknown killer. It all begins when Dave (John Travers), one of several young inmates at a juvenile detention center, commits suicide. It doesn't take long to figure out that Dave’s death was the direct result of the physical and mental abuse heaped upon him by fellow inmates Steve (Stephen Wight) and Lewis (Luke Neal). To prevent this from happening again, the warden instructs their guard, Jed (Sean Pertwee), to take all the prisoners in Dave's cell block, which, along with his two tormenters, includes Blue (Adam Deacon), Lindsay (Ben McKay), Jethro (Richie Campbell) and new arrival Callum (Toby Kebbell), to a remote island to teach them a little something about teamwork. Shortly after settling in, Jed and the others discover that another group of juvenile offenders, all female, has set up camp nearby. Jed tries to convince the ladies to leave, but their guardian, Louise (Alex Reid), refuses to go. Unfortunately for them all, someone else is on the island as well: a killer with a crossbow and a pack of vicious dogs. With no idea who this person is or why he’s after them, the two groups band together and start looking for a boat to carry them to safety, realizing all the while that the killer is watching their every move. At the outset, Wilderness feels like a teen drama with a strong anti-bullying message (in one particularly disturbing scene, Steve and Lewis corner both Dave and Lindsay in a closet and urinate on them). Even the initial sequences on the island are deceptively quiet, save the odd argument between the troubled teens. But the moment all hell breaks loose, it does so in a big, big way. Soon after discovering the severed arm of one unfortunate character who wandered off by himself, another is struck in the abdomen by an arrow, fired from an unknown location. A few seconds later, another arrow hits him… then another…. until finally the poor victim is pinned to a tree. It’s at this point the dogs arrive on the scene, tearing him apart (his hand is chewed off, and a huge chunk of flesh is ripped from his face, all shown in graphic detail). And rest assured this character won’t be the last to suffer such a violent death. If the movie has one weakness, it’s the ending (things begin to fall apart the moment the killer speaks, at which point he seems far less menacing than we anticipated. Not even an unexpected twist can save this disappointing finale). But for most of its running time, Wilderness is a tensely paced, well-acted tale of survival that’s sure to appeal to those who like their horror films bloody. I love Wilderness, but as you say, Dave, it's brutal as hell! Haven't seen it since it's release though, so it's definitely time for a re-visit soon!